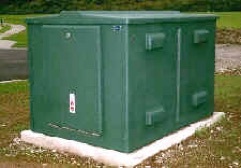 Picture to the left, Standard Height Transformer Cover. Length: 2000mm. Width:1400mm. Height: 1300mm. The picture to the left shows a TFC-1 Standard transformer cover with doors at each end and four vents each side. Your own special door locks can be fitted by us if you use a special master key. Transformer Cover Standard option, end entry TFC-1 $3,850.00 excl. Transformer Cover Standard Side Door entry, TFC-2 $3,875.00 excl. Your own special locks can be fitted by us if required. All Covers can be manufactured from 0 Spread Fire Retarded Resin at extra cost if required.